Two weeks ago, I invited readers to ask me questions or to ask me to write about something in particular. I’ve had a few responses, for which I’m very grateful. Thank you to those who responded for your contributions. This is just a quick note to let you know I have received them and to apologise for the delay in responding. I am not ignoring you, nor have I forgotten to reply. I will definitely respond to all of them, but it may take some time. I hope you will bear with me. So watch out for answers to questions such as “the correct thing to say to someone with cancer”; readjustments after treatment; living with uncertainty; and surrender and relief. If anyone else would like to ask me any other questions or would like me to write about how I deal with a specific aspect of living with myeloma, you can find the form on the Living with Questions page in the top menu. I am not any kind of expert, except about my own experience (and even then, not always), so I can’t/won’t attempt to answer medical queries about myeloma. There are plenty of good sites out there with that sort of information: please see the links on the right. But I will gladly write about how I feel and think about anything to do with my experience of living with myeloma. 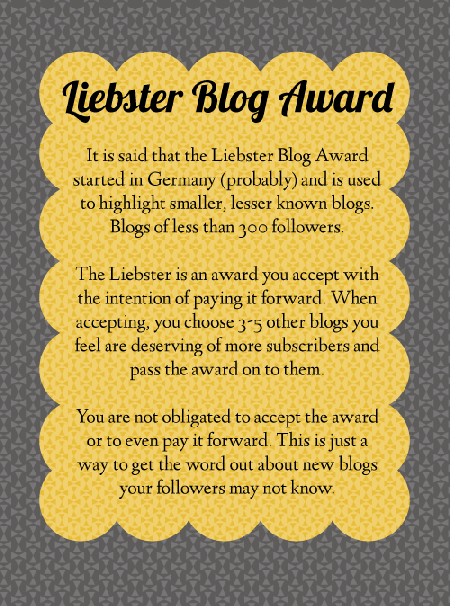 Three weeks ago, one of my blogmates, who writes Winning with Bipolar, nominated me for an award called the Liebster Blog Award. It’s a blogger to blogger award, a bit like a chain letter (which I’ve never been a fan of), but in a good way – helping to publicise lesser known blogs. I want to accept and I will… properly! There are several requirements of acceptance, the first of which is to thank the blogger who nominated me, which I have already done, and to acknowledge him here, so thanks JM! I’m tickled pink! I do hope some of you will visit his blog. However, the other requirements of acceptance are not so simple, so again I apologise for not responding sooner. This will take a little time, but it will happen! This entry was posted in Miscellaneous and tagged blogging, Cancer, Liebster Award, living, living with questions, relief, surrender, treatment, uncertainty. Bookmark the permalink. I’m sorry I haven’t responded to your earlier posts! I have kept the Anniversary one open as I do mean to respond eventually! The questionnaire one got mangled in the ether. HOWEVER my reason for writing today is to say Congratulations! about the Blog Award. I’m glad you are accepting it, apart from the fact you deserve it, I have realised just how valuable Access to Blogs are when I have been wanting to find out about life for ex pats in Luxembourg, where my daughter and family have just moved to. Keep up the good work, I realise what an effort it must be because, hopefully, life gets in the way. Thank you very much, Mavis! Please don’t feel you HAVE to respond, but your comments are very welcome. Thanks for your continued support. I’ve just had a thought that maybe one of my relatives used to live in Luxembourg. I’ll check and maybe pass on his contact details to you.